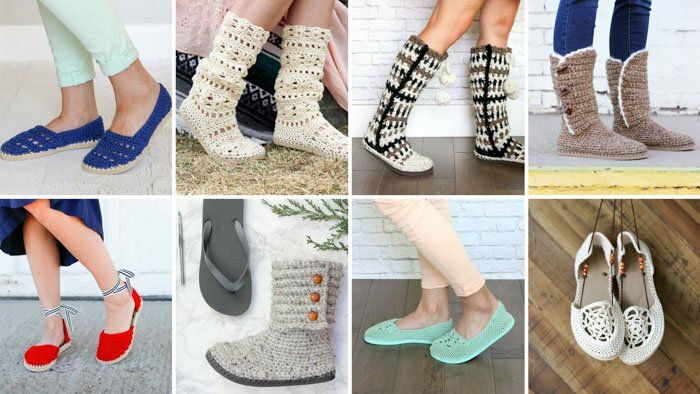 Learn how to crochet shoes with this easy free crochet pattern and tutorial. 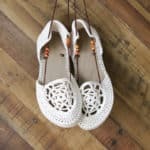 Because of their flip flop soles, these DIY kicks work well equally well as house slippers or outdoor shoes. Find the free pattern below or purchase the ad-free, printable PDF with printable hole poking ruler for $2.75 here. This free crochet shoe pattern and tutorial is part of a collaboration with my friends at Lion Brand Yarn. This post contains affiliate links. It’s finally flip flop season! Crochet flip flop season, that is! 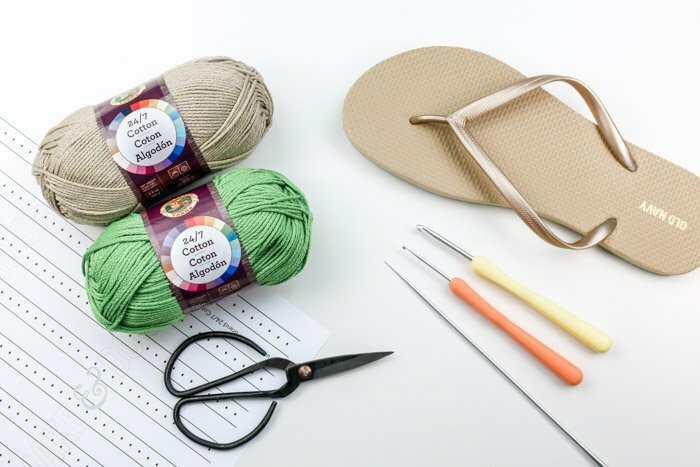 If you’ve never crocheted on flip flops before, today’s free pattern is a perfect project to learn how to crochet your own shoes. I love this pattern because it’s quick, easy to customize and SO gratifying to make something so comfortable, cute and functional. I started experimenting with crocheting on flip flip flops a couple of years ago and I’ve designed a lot of footwear in the process. 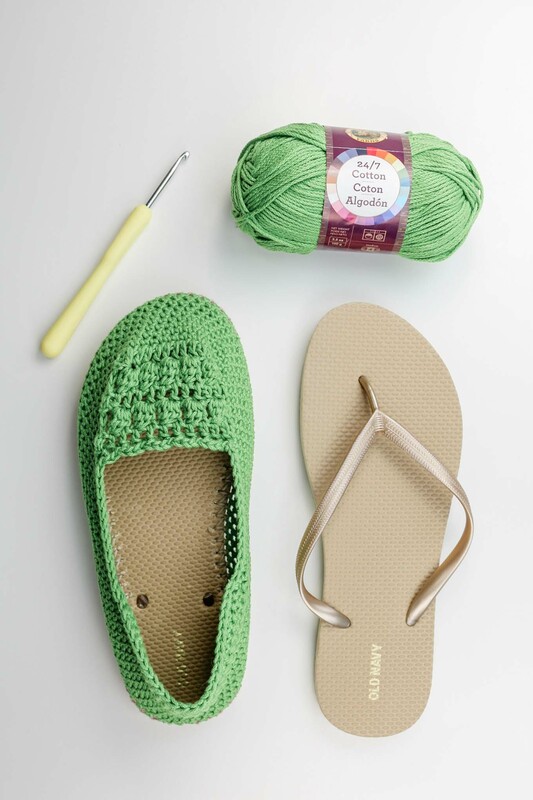 You can find all my free crochet patterns using flip flops here. Many of them have step-by-step video tutorials too! 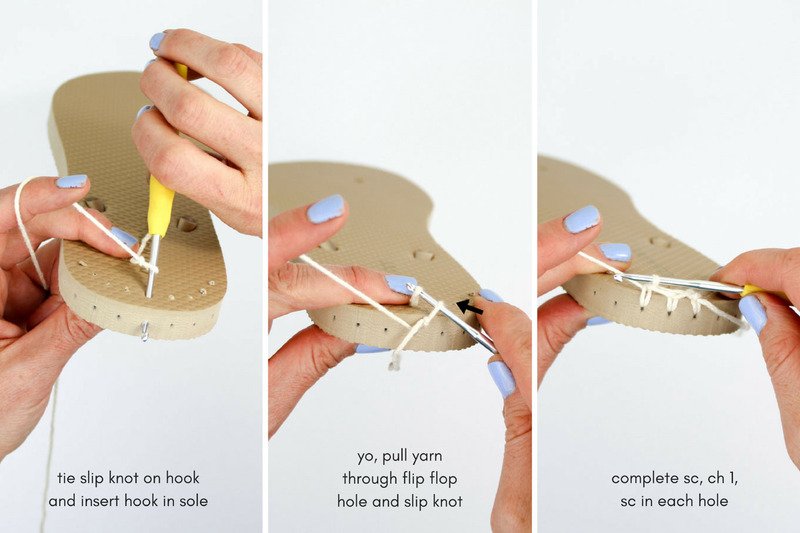 To transform flip flops into comfy flippers or shoes, you’ll remove the straps, poke holes in the rubber sole and then crochet into the holes. Over time, I’ve realized that the most critical part of the process is how far apart you poke the holes in the flip flop soles. This is what has the biggest effect on the gauge and helps ensure your shoes fit well. Even if I wasn’t friends with Lion Brand, I would go out of my way to hunt this yarn down. You can easily get yarn for your shoes in 24 different colors here. One other reason I love 24/7 Cotton is that it’s fairly thin as far as cottons go. 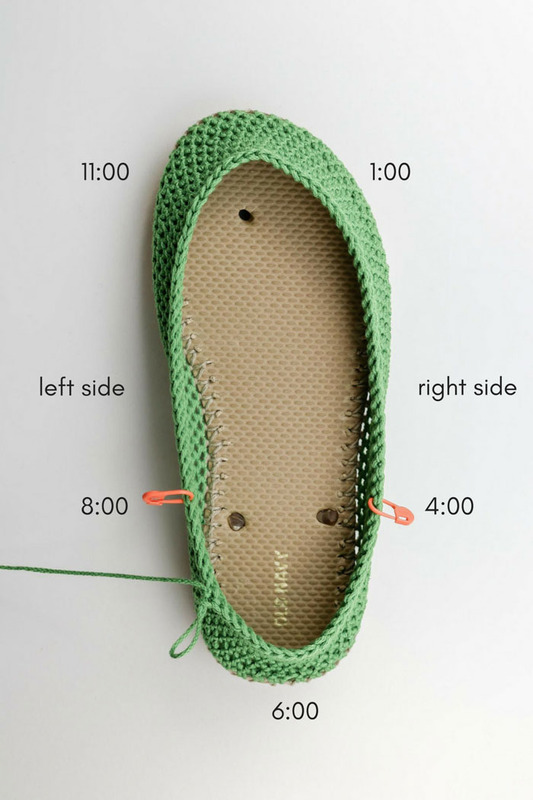 This means it’s able to be worked into the flip flop sole holes with ease and create delicate, beautiful stitches on the body of the shoe. It’s important to note though that while 24/7 Cotton is listed as a category 4/medium, worsted weight yarn, it’s really more similar to a DK weight. I’ve included some notes in the pattern on what to look for in the yarn you choose to work with. 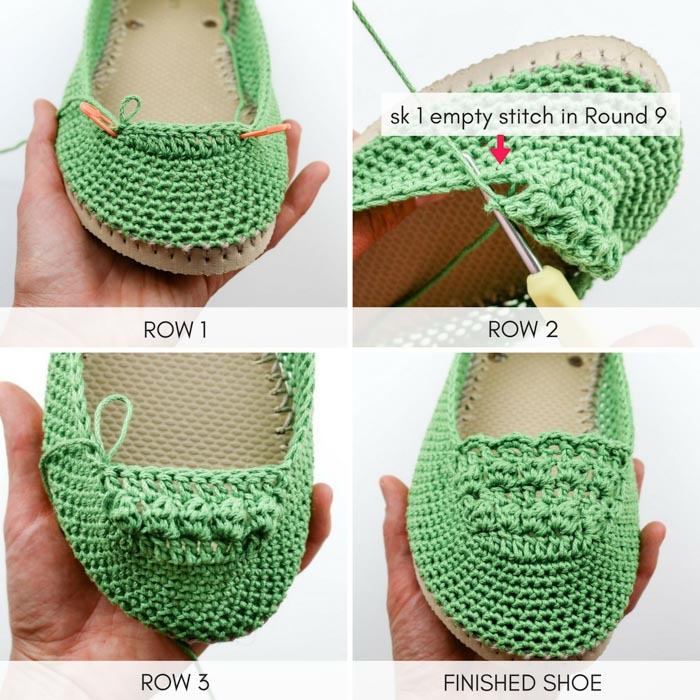 Once you master this technique though, head over to the free lightweight slipper pattern featured in the video to expand your crochet footwear collection! Purchase the ad-free, printable PDF with printable hole poking ruler here. Add this pattern to your Ravelry favorites/queue here. These brightly colored kicks are the perfect handmade footwear to carry you comfortably through the summer months in style. 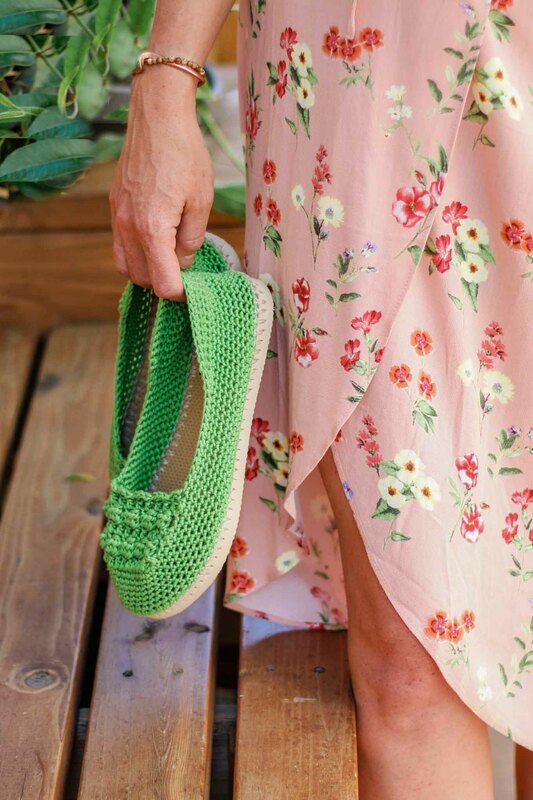 The functional combo of cotton yarn and a flip flop sole make these into incredibly comfortable house or street shoes–you might never want to take them off! 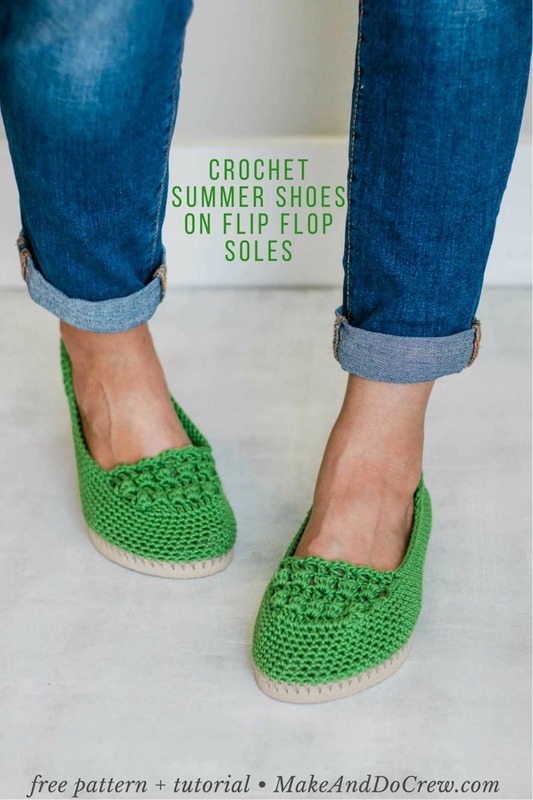 While the process of crocheting on flip flop soles might be new to you, this pattern is quite approachable, requiring a knowledge of single crochet, double crochet and working in the round. This pattern contains affiliate links at no extra cost to you. * While 24/7 Cotton is listed as a category 4 worsted weight yarn, it’s more similar to a category 3 DK weight yarn. If substituting yarn, consider another DK weight cotton. To use a true worsted weight cotton, space flip flop holes further apart using the second printable ruler at the end of the pattern PDF. This pattern works well for a women’s size 6-10. See notes for suggestions on making larger size. • Transforming flip flops into shoes isn’t an exact science! Keep an open mind and don’t be afraid to customize the shoes to your liking. Check out this Flip Flop FAQs post for answers to commonly asked questions. • You’ll likely want to size down when buying your flip flops. Look for a flop flop that offers about .25″ of sole around your foot (more like the fit of a normal shoe). In the pattern sizing, the shoe sizes mentioned describe the shoe size you normally wear and not the sized-down size of your flip flops. • The flip flops in the sample are from Old Navy–they have a great selection of colors. Find $1 flip flops on Amazon or at Walmart. Dollar Tree’s $1 flip flops tend to be a bit too flimsy, but can work if you are very careful. • Similar to some ballet flats, your shoes should curl in a bit. That’s what gets them to shape to your feet without a lot of increasing or decreasing. They will stretch out slightly with wear. • The shoes are crocheted tightly, similar to amigurumi. Make a deliberate effort to keep your stitches tighter than normal. Check your gauge if you’re unsure. • The shoe sides and heel are worked in a spiral, so you will not ch 1 at the beginning of each round. • Left and right shoes are identical. • To make a larger size shoe, try adding an additional round or two in Rounds 1-9. You may also choose to work one extra repeat of Rows 2 and 3 in the toe section. Trim straps off flip flops by cutting the mid-foot straps at an extreme angle so you can keep them in place without feeling them inside the shoe. (See photo below for example of straps cuff off.) Save the rubber plug from the strap between your toes and glue back in place if desired. If using the printable hole-pocking ruler, trim and tape pieces together. Tape ruler around flip flop sole. Alternatively, hold a measuring tape up to the flip flop sole. With your sharp instrument, poke holes in each dot on the ruler or approximately 7 mm apart. (See photo in blog post above.) Pierce the hole at an angle from about the middle of the way down the sole to approximately .25” into the top of the sole. Ensure your holes are far enough from the edge so that the yarn won’t rip through the rubber when you create your first row of crochet. If using heavier cotton that’s more similar to a worsted weight cotton, try poking holes approximately 1 cm apart. Tie slip knot around smaller hook. 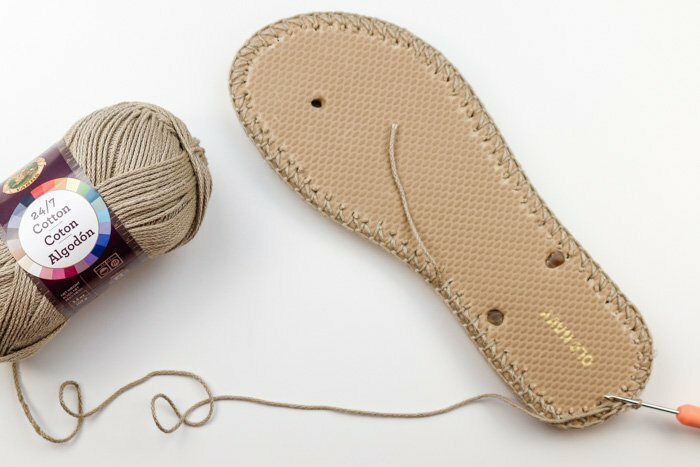 Insert hook at back of heel (6:00 position) from the top of the flip flop toward the bottom of the sole, grabbing the yarn and pulling through to the top of the flip flop and through the slip knot to attach the yarn to the flip flop. Crochet over the tail of this yarn as you work Round 1. Round 1: Continuing with smaller hook, sc in each hole around sole, join with a sl st to first sc. Do not turn. Place marker in first st of round and move it up as you work each round (or just keep track of which sole hole you began in). Rounds 2-9: With larger hook, sc in each sc around sole. Do not turn. Do not turn work, continue with the rest of row 9. Row 9 cont: Sc in each sc until 1 st remains before next marked st, sl st in next sc, turn. Row 10: Ch 1, sk first sl st, sl st in next sc, sc in each sc until 1 st remains before next marked st, sl st in next sc, turn. Rows 11-12: Ch 1, sk first sl st, sl st in next sc, sc in each sc until 3 stitches remain before next marked st, sl st in next sc, turn. Row 13: Ch 1, sk first sl st, sl st in next sc, sc in each sc to back of the heel, sl st in next sc. Fasten off. Do not weave in end. You’ll work over this tail later. • Left-handed crocheters: reverse all mentions of right and left. • See photo above for more details on Rows 1-5. Find the approximate midpoint of the front of the slipper (12:00), then place stitch markers at the 1:30 and 10:30 positions with 12 sc between them. Join yarn in 11:00 marked st. (Left handed crocheters, join in 1:00 marked st.) Weave in the tail from attaching yarn now before this section is worked or crochet over it in Row 1. 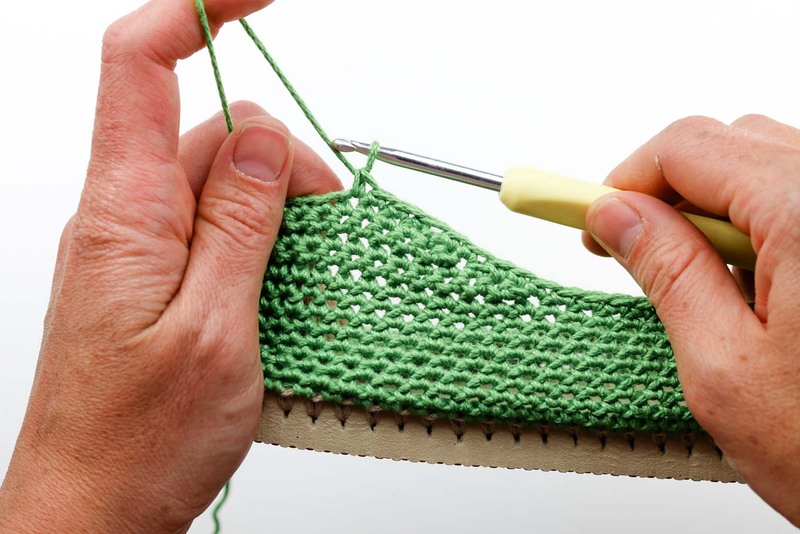 If the shoe is fitting a bit loose, work 2-3 decrease stitches (sc2tog) near the heel as you crochet Round 1. Round 1: Sc in each empty sc st around sides and heel of shoe stopping once you reach the shoe top section; to finish toe section with a scalloped edge: [3 sc in first dc, sl st in next dc] 5 times, sl st in next 2 sts from beginning of round. Head out to frolic through a field of clover. 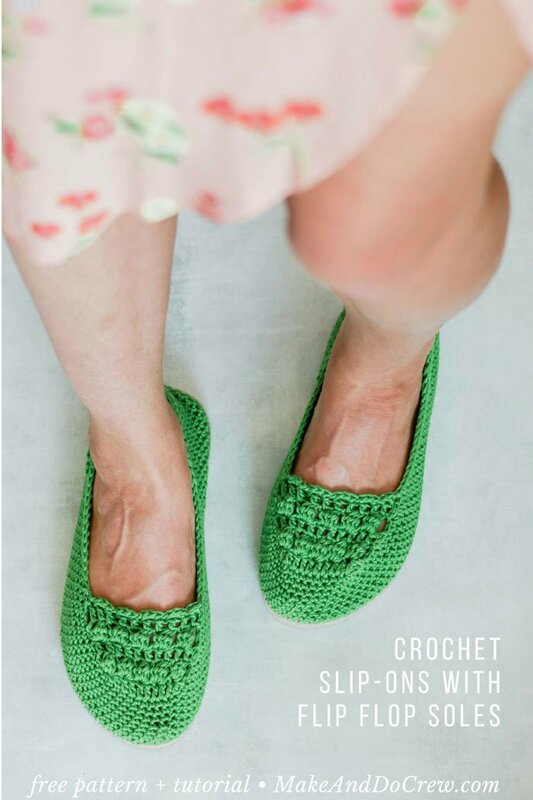 Grass stains have nothin’ on you with these crochet kicks! I love to see your finished projects! Use #MakeAndDoCrew and tag me Instagram (@MakeAndDoCrew) to show off your stitches and have a chance to be featured! 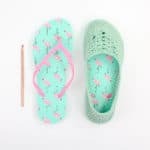 WANT MORE FREE CROCHET FLIP FLOP PATTERNS? 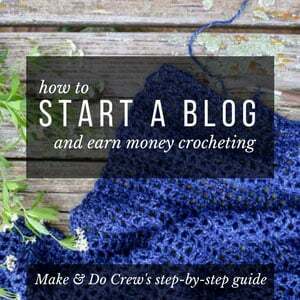 I'd love to send you more free crochet patterns that'll knock your little handmade socks off! You in? 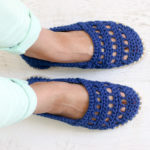 Lightweight Crochet Slippers with Flip Flop Soles – Free Pattern and Video! Thanks,can you explain it in spanish,I like it,but I don’t understand weell English. Absolutely love the pink floral dress in your photos! So pretty!! Què pena que no tengas una pàgina en Youtube, serìa mucho màs fàcil seguir tus explicaciones! Been waiting all winter for additional slipper patterns from you Bought a dozen flip flops when wal-mart had them on sale last fall and have my supplies all around now to start my my slippers for my retired neighbors here in my apartment complex. Since they are all over the age of 65 I wanted something with a sole so they would not slip on the tile floors. Thank you so very,very much.